It’s finally through the edit. 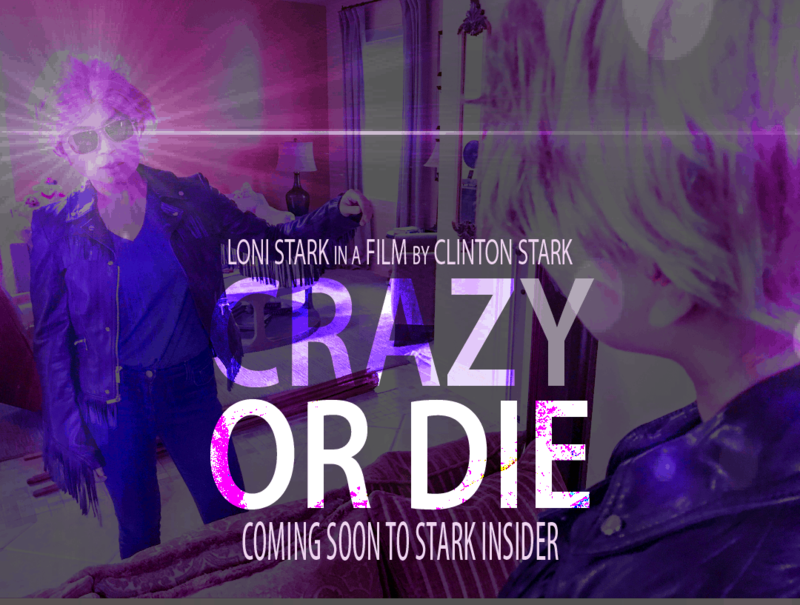 Look for our new original short Crazy or Die starring Loni Stark right here on Stark Insider on Wednesday, May 3, 2017. 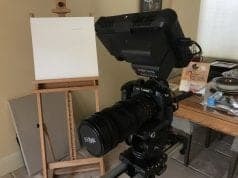 If you’ve followed Stark Insider through the years, you might know that a camera test for us is actually one that uses the camera for a project. I figure there’s enough real “camera tests” already out there, many excellent, on YouTube that showcase sharpness, features and so forth. For me, though, it’s all about the usability. If a camera doesn’t feel good in my hand then the specs really don’t matter much to me. When we first got the Canon C100 Mark II, we headed to Union Square in San Francisco and shot Harley Quinn: Revenge at Union Square. Harley Quinn. Union Square. Dynamite. What could go wrong? Then with the RED Raven, I figured I could shoot my wife baking an apple pie. Cliche. So I added a gloved killer. More cliche. So things then took a turn when we shot All American Apple Pie. So when we got the new Panasonic GH5 mirrorless camera I knew we should once again head to the deep end and try to drum up something. It took a few weekends to shoot. 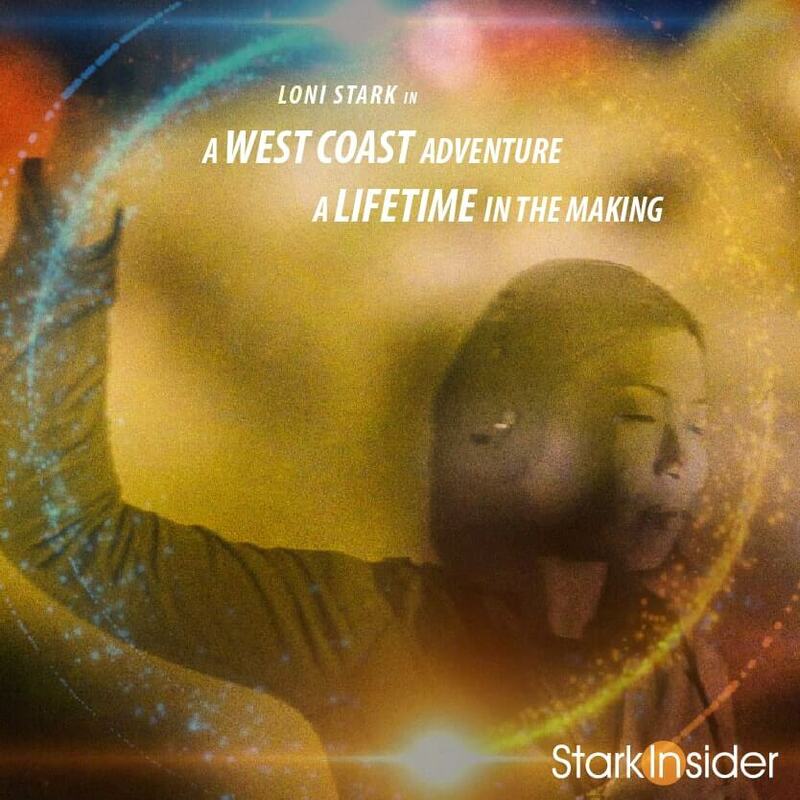 And one very supportive spouse (once again) in Loni Stark. She even endured (once again) me showing her BTS scenes shots of Naomi Watts in Mulholland Drive (once again). See! Watch! Like that! 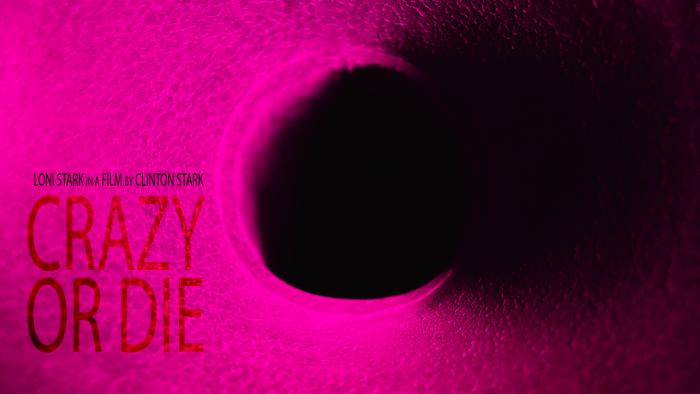 Crazy or Die, the sequel to All American Apple Pie, lands here on Stark Insider this Wednesday. 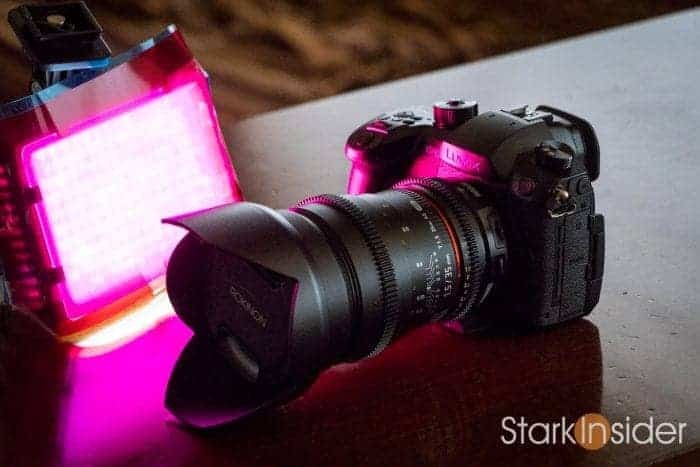 Panasonic GH5 with Rokinon 35mm lens and my DIY light gel. 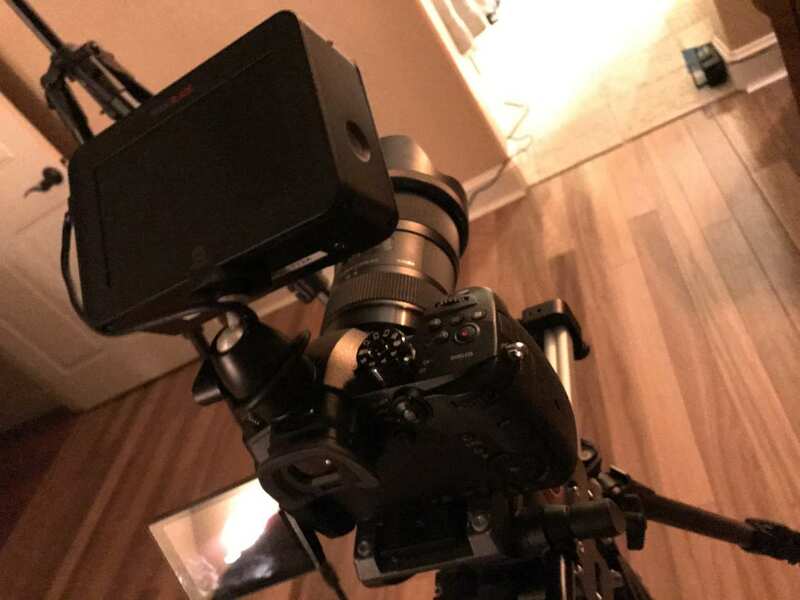 Panasonic GH5 with Ninja Blade monitor ready to shoot a scene for CRAZY OR DIE. As for the new GH5 camera? 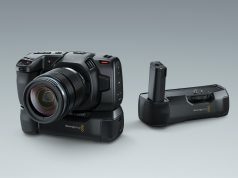 It’s utterly phenomenal for video work. The in-body stabilization is so good, I can even use nice cine prime lenses handheld. 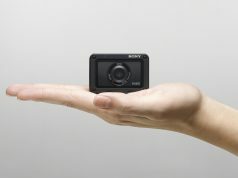 That in itself reason enough to buy this camera for short films, music video and documentaries. 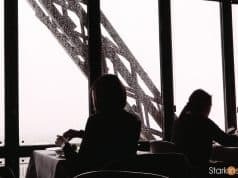 Unlike something like the Sony a6500 mirrorless camera, you don’t get a bunch of wild jello or rolling shutter when shooting handheld. And the 10-bit files are very nice to work with (in Adobe Premiere Pro I had to use proxies to edit, and they work really well… fast and smooth). For photos I’m still partial to the Canon EOS 80D (and little Sony a6000). 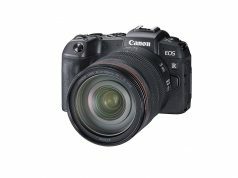 It has a 24MP sensor so there’s more to work with in terms of resolution. But, more importantly, I like the handling of the 80D better than the GH5 when it comes to photos. It has an old school optical viewfinder (as opposed to electronic) which feels perfect to me. The handling is great, and focus performance is better in my experience. Still, the GH5 takes great photos. No doubt. This is more about handling and personal preference. If I had to take only one camera with me on a trip… it would definitely be the GH5. If you’re looking to get into videography, or perhaps upgrade your camera body, the GH5 should be on your short list. If you’re looking to get into videography, or perhaps upgrade your camera body, the GH5 should be on your short list. I’d give it 5 out of 5 stars if I were writing up a proper review. I don’t recall a camera this good coming out in a long while. The biggest surprise for me so far is that the image is not “digital” as I suspected it might be. I shot my short film Crazy or Die in 4K with V-Log and did some (admittedly ridiculous) color grading and loved the results. Warning: don’t judge skin tones based on my videos! 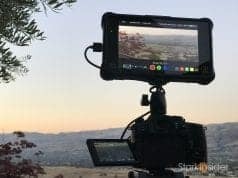 I’ll still use the outstanding Canon C100 II for short doc work and interviews here on Stark Insider in and around the San Francisco Bay Area. That Dual Pixel AF is pretty darn amazing. For just about everything else, though, I think I might be often turning to the Panasonic GH5. Over the weekend we had a “preview test screening” of Crazy or Die for a VIP audience (okay, family members). That was a first — and I feel their pain. We put it up on the big screen. It’s quite an experience to see your work projected on a 10-foot screen and with full surround system, versus where I normally review them, on a smartphone or tablet (or my editing system’s monitor). Crazy or Die. Wednesday, May 3, 2017. See you there! Thanks for following along here on Stark Insider. Oh: Did you know boa constrictors swallow their prey whole, without chewing? A short film by Clinton Stark, featuring Loni Stark (and friends). Shot on Panasonic Lumix GH5. Sigma ART and Rokinon cinema prime lenses.